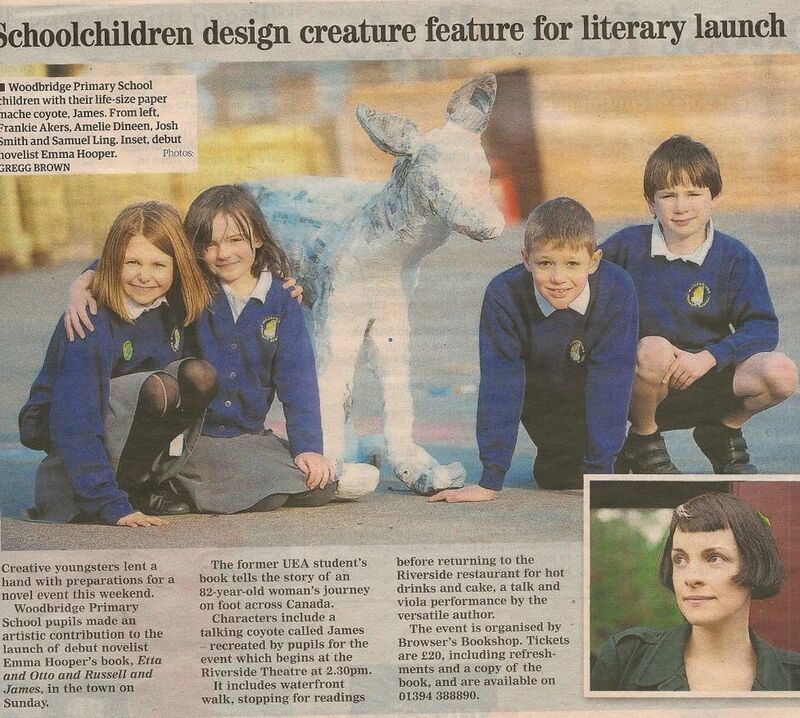 Pupils from Woodbridge Primary School have created a lifesize coyote out of paper to mark the visit of debut novelist Emma Hooper to the town this week. Emma is launching her novel 'Etta and Otto and Russell and James' in Woodbridge. It has just been named as the Radio Two Book Club book for February and she has received glowing reviews and high profile interviews throughout the media for many weeks. I read the book some months ago as a proof, sent beautifully packaged with all sorts of themed goodies. I loved the story and wanted my event for Browsers Bookshop, with the Riverside Restaurant, to give guests a similarly memorable introduction to this wonderful book. The schoolchildren have created a papier mache model just like those made by Otto in the story. They've made a coyote to represent the talking coyote in the book, who's called James. We will eat maple syrup cookies to remind us of the Canadian setting and the event will begin by echoing Etta's 2,000 trek to the sea, with a 20 minute walk along the River Deben. We hope the snow will hold off long enough for us to enjoy the afternoon. Emma says the journey from Bath to Woodbridge will be nothing to her - she is used to the vast expanses of Canada. But is she familiar with British Sunday train travel?